President Abbas underscored his commitment to peace and the two-state solution, as well as the path of negotiation to achieve them, reiterating that peace in the Middle East cannot be realized without an independent Palestinian state, with East Jerusalem as its capital. “We have always fully and positively engaged with the various initiatives of the international community aimed at achieving a peaceful solution between us and the Israelis, including the Arab Peace Initiative,” he told world leaders gathered for the Assembly’s annual debate, noting that he also engaged with United States President Donald Trump and his administration from the start of his tenure. Those decisions, have also caused the US administration to lose its eligibility as the mediator in the Middle East peace process, he said. “The path to peace is enshrined in your [the UN] resolutions, including resolution 67/19 of 29 November 2012, which was adopted by an overwhelming majority and refers to the State of Palestine on the basis of the 1967 borders,” he stressed. 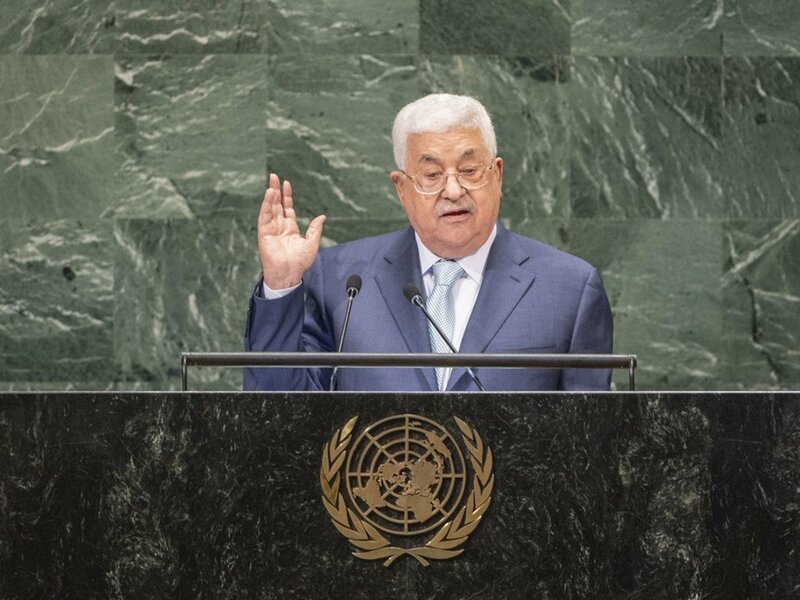 Mr. Abbas also highlighted what he called “racist” laws enacted recently in Israel, which not only discriminate against the Palestinian-Arab citizens, but, will also lead to the “inevitable” nullification of the two-state solution. Palestinian people and the territory of the state of Palestine are in urgent need of international protection, he said, and while he welcomed economic and humanitarian support in the West Bank and the Gaza Strip but added that such support cannot be a substitute to a political solution to bring an end to the Israeli occupation. President Abbas also highlighted the importance of the work of the UN Relief and Works Agency for Palestine Refugees in the Near East (UNRWA) and urged all countries as well as the General Assembly to support the agency.